Young and old alike we love getting gifts in a little pink bag that has become quite familiar to most of us, Victoria Secret pink paper bag. 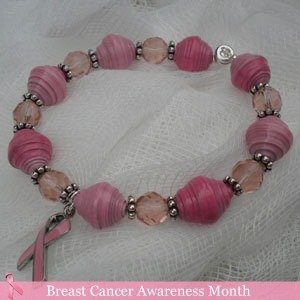 So, here’s another paper to paper bead idea that coincides Breast Cancer Awareness month, in the form of a bracelet that I simply call Pink. These pink bags come in small and big ones, you just need to open it and you can cut your triangle as long as you want them to be depending on how big you want your beads to be. 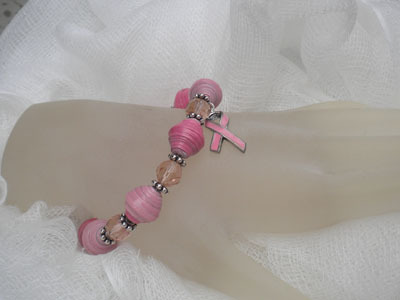 The pink ice crystals and pink ribbon charm completes the whole bracelet. Gift bags are great for paper bead making because they are glossy and beautiful colors. It is funny sometimes when I get more excited about the gift bag and the tissue picking out from it than the actual gift, and think paper beads! How gorgeous! I was trying to make some pink beads for a bracelet for my DIL, but they were not turning out very well, so this is such a great idea…I’m not a Victorias Secret fan, but maybe I can steal from someone!!! Hehehe. oh my, this has been the most awesome site i’ve ever visited. i started browsing and i can’t stop. so many ideas. thanks for this awesome site. i started making some paper beads and got addicted to it. thanks so much! 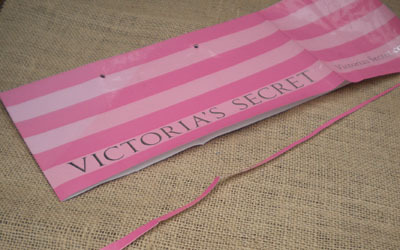 i’ll start begging my friends to give me their vs bags!!! i super love the bracelet!! Pink is just pretty…..I love it. Cheers to Michelle as well!